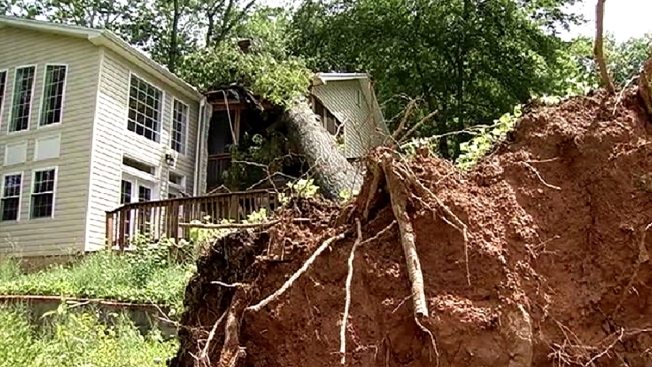 Thousands in Northern Virginia are going into Wednesday night without power, a day after strong storms slammed the region. Crews have been working long hours to get the power back on and clear fallen trees. Dominion Virginia Power still had about 2,400 without power as of late Wednesday afternoon. Crews were aiming to get everyone back up and running by late Wednesday night -- but it’s not easy. Tuesday evening's soaking rain and strong wind pulled down trees, tangling them into the power lines. One tree alone toppled more than two dozen power poles. "The main thing is to make sure nobody gets around any of this stuff here," said Henry Ortiz of Dominion Virginia Power, gesturing to fallen power lines. "...[T]he public should just stay away from all of this." Ortiz had several crews to coordinate, some clocking in close to 20 hours of long, labor-intensive work. "Little by little," Ortiz said. Jeff Flis' J-L Tree Service team was hard at work too, hoisting the trees up and out, piece by piece. A single piece weighed about 3,000 pounds. The removal comes with a hefty price tag, too. "This job right here is probably in excess of $9,000," Flis said. A few houses down, the Kim family would normally be at work. But on Wednesday, they took leave for major reconstruction after a tree crashed onto their home, cracking through the ceiling. "I was too shocked to be scared or anything," said Tae Kim. "I couldn't believe what was happening." The tree smashed the garage, kitchen and porch; damage is estimated at about $100,000. Across Fairfax County Wednesday, drivers found detour after detour, where downed trees and power lines had several major roads shut down. Dozens of Dominion Virginia power crews are focused on getting the area back to normal -- but in the meantime, some drivers are hitting roadblocks. Twinbrook and Olley road are both shut down, as is the major intersection of Ox Road and Braddock Road. Fairfax County Police said they're hoping to get that intersection back open by the Thursday morning rush.